Management texts do a brilliant job of categorising and detailing management thinkers – the people that have shepherded or at least recorded the impressive rise of industrialisation in the 20th Century. Industrialisation generated unprecedented material advances for us. The down side is the impact on the environment and the ossification of management practice. 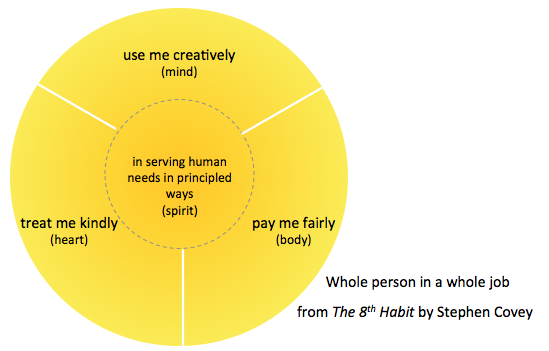 I have revisited Stephen Covey’s 8th Habit, to shape up the challenge of redefining management. He quotes the great Peter Drucker. He elaborates on Peter Drucker’s thinking about the revolutionary changes precipitated by the information age, outlined in Drucker’s prophetic 1992 Harvard Business Review article. This video by Stephen Covey outlines the significance of the transitions from age to age. It’s no longer a world of controlling people. It’s a world of unleashing people. The management control fetish perhaps peaked in the eighties when the language of management referred to people as “labour units”. In contrast Stephen Covey builds on the “whole person” paradigm from his best selling 7 Habits of Highly Effective People. This acknowledges our four dimensions, physical, intellectual, social/emotional and spiritual. From this perspective, employment doesn’t just transact work for material rewards, it also enables creativity and social connection all done to serve “human needs in principled ways”. So what is the 8th Habit? It is to “find your voice and inspire others to find their voice”. He suggests we harness creative forces to enable voice, rather than following the “cultural software” that leads to loss or suppression of voice. This is significant as the habits of industrial era management are enculturated. An epochal change is required that may take a generation or two. We are not just “labour units”. We don’t exist only to work. In finding our voice, in an empathetic social setting, whether it be work, family, or community, our lives are enriched and our search for meaning facilitated. The organisations we contribute our energy and creativity to get the benefits of our engagement and enthusiasm. Since the turn of the Century, there have been many people articulating the necessary changes, including my book Better Business for a Better World, first published in 2000. There is a plethora of guidance from books, blogs and videos. Peter Drucker and Stephen Covey were not the first to signal a new management paradigm, but they bring a rare clarity to shine a light to a better future. This entry was posted in Communication and engagement, Culture and values, leadership, Organisational learning and tagged 8th Habit, find your voice, Peter Drucker, Stephen Covey. Bookmark the permalink.